"This proposed rule is a critical step in our effort to reduce the threat of gun violence," the attorney general said. 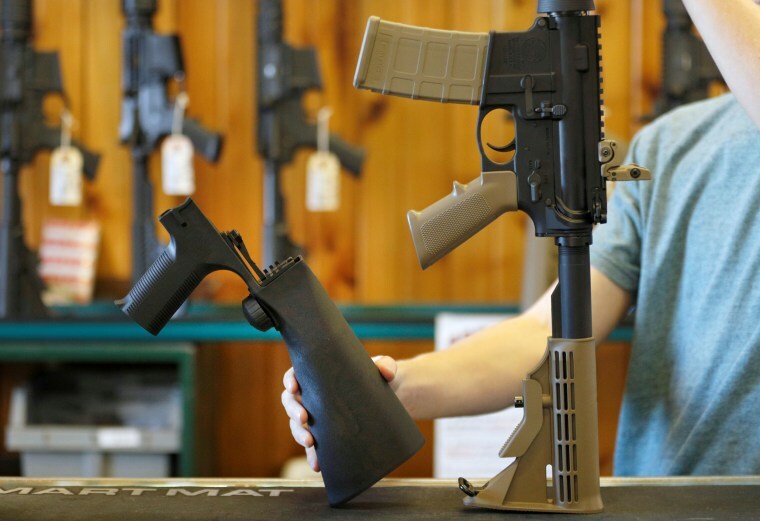 WASHINGTON — Firearm bump stocks would have to be surrendered, destroyed or made inoperable under a ban proposed Friday by the Justice Department. President Donald Trump listed the bump stock ban as one of the measures he would support after February's school shooting in Parkland, Florida. When attached to a rifle, a bump stock allows recoil action to move the weapon back and forth against the trigger finger. After the first pull, the finger remains stationary and the weapon repeatedly bumps against it: in essence, the rifle then fires itself. The Bureau of Alcohol, Tobacco, and Firearms determined earlier that bump stocks should not be classified as machine guns, because the weapons they were attached to still required a separate trigger pull for each round fired. But in proposing the new rule Friday, the Justice Department said the earlier ruling "does not reflect the best interpretation of the term 'machine gun.'" Weapons classified as machine guns are grandfathered and may be kept if they were legally possessed before the Gun Control Act of 1968 was passed. But because no bump stocks existed before the law was passed, the proposed rule said, gun owners who have the devices now "would be required to surrender them, destroy them, or otherwise render them permanently inoperable." The proposed rule will be published in the Federal Register next week, providing for 90 days of public comment. The government can then make the rule final. Sessions' announcement came the day before a large anti-gun violence march set for Washington, D.C., on Saturday.